A rare fully functional Apple-1 Personal Computer sold for $365,000 at an auction in New York today, reports Reuters. The computer, which Steve Jobs originally sold out of his parents' garage in 1976 for $600, was expected to sell for much more, with initial estimates placing its value at $400,000 to $600,000. In 1999, the machine auctioned off today was purchased by Bruce Waldack, an entrepreneur who had funds after selling his company, DigitalNation. 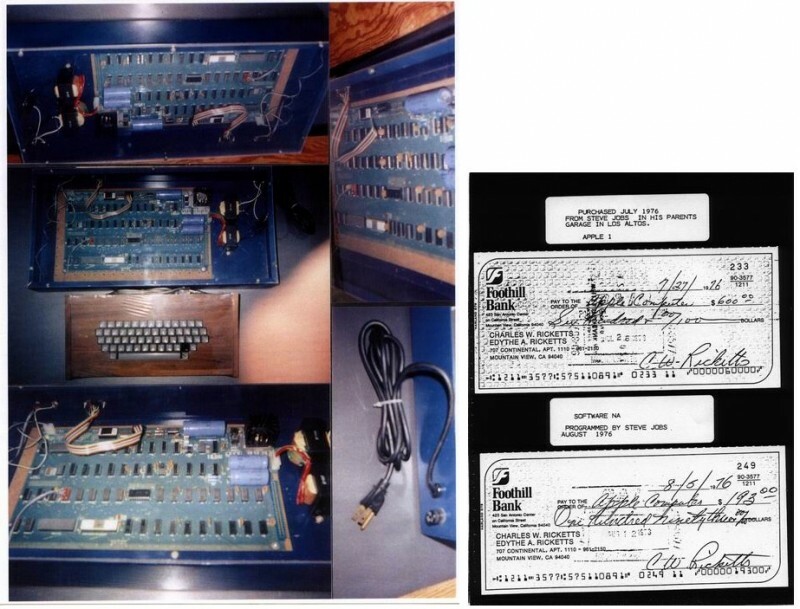 Following his death in 2007, the Apple-1 went on to be auctioned at a storage facility in Virginia, where Robert Luther purchased it, along with the original buyer's canceled check from 1976. The Apple-1 was sold alongside that canceled check, which was made out to Apple Computer from Charles Ricketts, who labeled it "Purchased July 1976 from Steve Jobs in his parents' garage in Los Altos." A second accompanying check for $193 was labeled "Software NA Programmed by Steve Jobs August 1976." An expert tested the Apple-1 to ensure that it was fully operational and able to run the standard original software program, Microsoft BASIC, along with an original Apple-1 Star Trek game. Other working Apple-1 computers have sold for far more in the past. Recently, the Henry Ford Museum paid $905,000 for an original Apple-1, and in 2013, an auction that included a working Apple-1 and a letter written by Steve Jobs went for $671,400. Less than 50 Apple-1 computers are believed to be in existence today, of the few hundred that were originally constructed by Steve Jobs and Steve Wozniak. The final price paid seems much lower than I would have thought, with it having the check from Jobs and all. It's a little sad a museum had to pay so much more to preserve a piece of history. I hope those bidding against the museum in that auction feel just terrible about themselves. Unless they were shills, they have no reason to feel terrible about anything. $800 to $365,000 from 1976 to 2014. That is a mighty good rate of return for a fully depreciated object.